St Mark’s Church opened for worship in 1892 as the South Parish Church of Aberdeen and adopted the name it now bears on its union with East and Belmont Church in 1972. Locally known as the “Salvation” in the “Education, Salvation and Damnation” block of buildings on the north side of Rosemount Viaduct the church sits between the Aberdeen Central Library and His Majesty’s Theatre. If you would like to know more about the church building Click Here or to read about our history, Click Here. 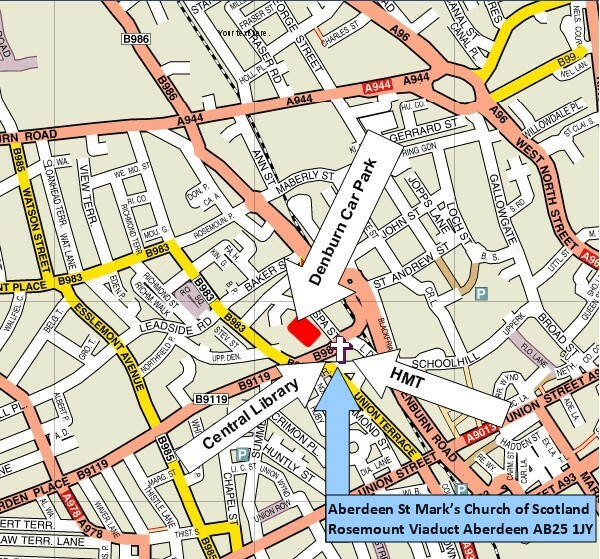 St Mark’s was one of the Aberdeen City Centre Parish Grouping churches until June 2013, along with the Kirk of St Nicholas Uniting and Queen Street Church . 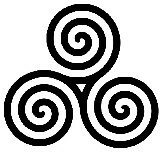 The Triskeles was the symbol adopted by the Group. Clicking on the symbol will open a new window to the remnants of the Grouping Pages. The Grouping was terminated by Aberdeen Presbytery to allow changes to the Presbytery Plan and to make changes to City Centre Ministry. The three churches however continued to work together informally, until November 2017 when Queen Street and St Mark’s united, retaining the name, St Mark’s. Clicking on other symbols throughout the site will open new windows to relevant pages. Enjoy! Explore! St Mark’s is a family friendly church and everyone is welcome to worship with us and join in all of our activities. Just come along any Sunday or visit any of our events. Click the Menu items on the left or the Menu at the top of the page for further details and information. To e-mail the Church office Click Here. 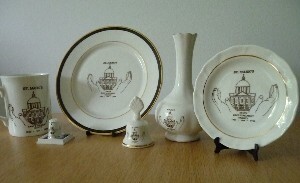 The St Mark’s Logo as shown above is taken from a design by Leona McConochie which featured on a range of commemorative china etc produced during our Centenary celebrations in 1992. The charge is currently vacant.